Petr Sušanka, PhD, was born in the city of Karlovy Vary in Czechoslovakia on January 24, 1938 and passed away on November 3, 2016 in Valec in the Czech Republic. He was the only son of Frantisek and Gertruda Sušanka. Petr had a remarkable career as an athlete, scientist, writer, teacher and administrator. He did his graduate work and received his PhD from Charles University in Prague, where he worked as Professor of Biomechanics. Dr. Petr Sušanka became a pioneer and expert in biomechanical 3D motion analysis of elite athlete performances. He was an active member of the first International Society of Biomechanics of Sports (ISBS) elite athlete research teams, starting with events like the 1976 Montreal Olympic Games, World Athletic Championships and others. Petr gave scientific papers at ISBS meetings, “bridging the gap” between the latest in biomechanics and the practical coach. He was one of the original members of ISBS, served on the Board of Directors and was a Vice President. At a great financial expense to himself, Petr Sušanka hosted the VIII., ISBS Symposium in Prague, Czechoslovakia (July 3-10, 1990). Petr made the VIII., ISBS in Prague a monumental success in spite of extreme difficulties caused by the disintegration of the Russian totalitarian dictatorship and occupation of Czechoslovakia (1948-1990). As the Czech Republic gained its freedom from Russia, Petr gave more and more of his energy and time to rehabilitate the Czech Republic, a country devastated by years of communist neglect and abuse. He formed “Conex”, “Consporty,”, “Coninform” and the “National Institute of Education”, which became successful entities for social, scientific and educational improvements in his native country. With great enthusiasm, Dr. Petr Susanka started major projects to save and rebuild the many baroque monuments in towns and churches in the Czech Republic that had been neglected and abused during the communist occupation. For his restoration projects he went for financial help to the Ministry of Culture, private business and citizens in the Czech Republic and Germany. Petr’s enthusiasm spread and all baroque monuments have been restored. Petr moved to the town of Valec to comfort and help his disabled mother, Gertruda, while he continued his professional and community work. He was loved in the community and elected the Mayor of Valec several times. After his mayor years Petr Susanka took on even broader projects for the purpose of promoting standards in rural Czech areas, to equalize the opportunities for youth to the level of cities. His MAS action group expanded and Petr was electd Chairman of all the Czech Republic action groups. The European Union recognizer his work and projects with financial EU subsidies and honors. Above all, Petr Susanka was a humor loving kind man you could count on and trust. As he goes to the other side of the sun, he leaves behind what in his life is his treasure, his two daughter, Katerina and Petra with five grand children. 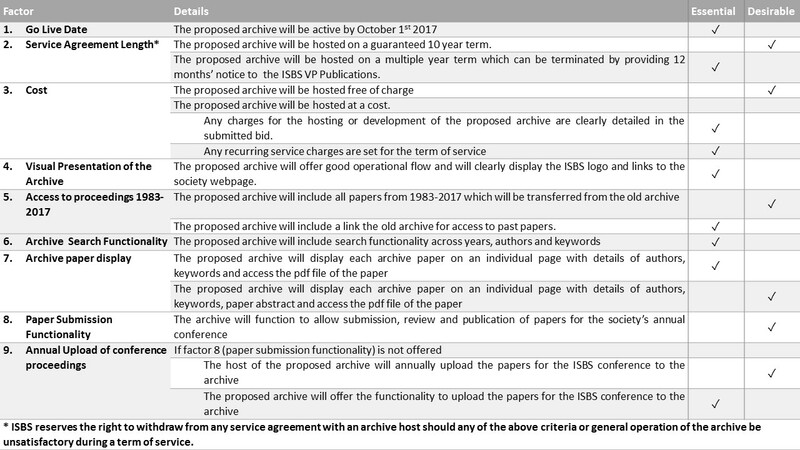 The Vice President for Publications and Board of Directors has opened a call to host the Archives for the Proceedings of ISBS conferences. The deadline for this call is January 31st 2017. The proposals received by the VP of Publications will be formally evaluated by the members of the Executive Committee, with a report and recommendation provided to the Board of Directors. In the event of two or more proposals being received by the VP of Publications, all proposals that meet the essential criteria will be circulated electronically to all Board Directors. The final selection of the archive host will occur by a voting process that, in the case of only one proposal received, will be a vote on whether to endorse the recommendations of the Executive Committee, or in the case of more than one proposal, a vote to select the archive host. In the event that no proposals are received, the VP of Publications will make a second call for submissions on February 1st. The deadline for the second call will be March 31st. To maintain integrity in the evaluation and selection process, members of the ISBS Executive and Board of Directors are not permitted to accept gifts or any methods of procurement in the archive bidding process. If a bidder is revealed to breach this condition, via strong evidence provided to the President, then the bid will be removed from consideration for that year.